Basketball players are spoiled for choice when it comes to indoor basketballs. From texture to bounce, every basketball has a uniqueness about it that every player loves to discuss. You should only use an indoor basketball on hardwood courts, as they wear down quickly if played outdoors. Their softer and leather-like properties make them a joy to handle, but they don’t hold up well against rougher surfaces. For this article, we’ve shortlisted our top 5 to help you pick the best indoor basketball for you. But before we dive into the list, we’ll gloss over the key terms you need to be aware of when buying a basketball. Sporting goods manufacturers make basketballs using either rubber, composite leather or genuine leather. Rubber basketballs are inexpensive but hard-wearing. Discount stores typically sell cheap basketballs made from rubber. They don’t feel good in the hands and lack the texture and bounce characteristics of competitive game balls. Only consider a rubber basketball for outdoor purposes. Composite leather basketballs are made using synthetic leather. They are softer than rubber basketballs and provide better grip. A good composite leather basketball feels similar to a genuine leather basketball but doesn’t cost as much. The NCAA Basketball Tournament Game Ball is made from composite leather. Genuine leather basketballs are the highest quality basketballs on the market. They have a break-in period, but after that their handling is unmatched. 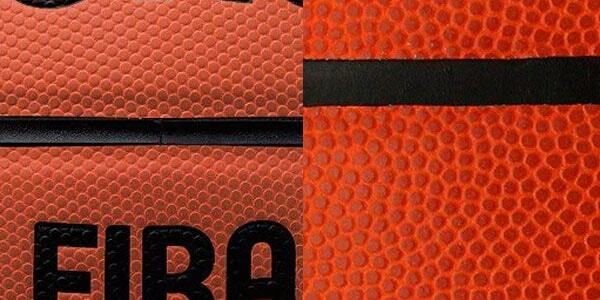 The Official NBA Game Ball is made from genuine full grain leather. Perhaps most important of all, a basketball needs good grip. Too little grip can make catching passes, dribbling and palming the ball harder. However, more grip is not always better. In 2006, the NBA replaced genuine leather basketballs with composite leather basketballs. NBA players complained the new basketballs had too much grip, and in 2007 the old genuine leather basketballs were back. A good basketball feels soft. Slight cushioning improves the feeling of receiving passes, dribbling and releasing a shot. Rubber and cheaper composite basketballs are usually too firm. A good basketball is tacky, not slippery. They have a slightly moist, sticky feel to them. Finally, a good indoor basketball has a consistent bounce. They bounce like an official game ball and bounce the way you expect it to, every time. The seams and pebbling of a basketball can have subtle effects on its bounce. 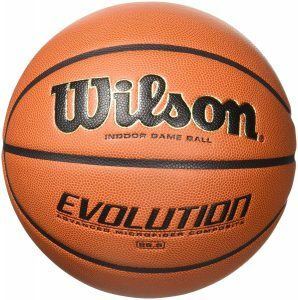 Extremely popular in high school and colleges, the Wilson Evolution is the best-selling composite leather basketball on the market. NCAA in-season tournaments use the Wilson Evolution more than any other basketball. Wilson are known for their grippy and soft, almost buttery texture that their microfiber composite cover gives. Most players love it, but some players prefer the more natural feel of Spalding or Nike basketballs. Channels are pebbled, giving them extra grip. And just as you’d expect from a basketball used in competitive play, the basketball has top-notch bounce consistency. Price-wise, the Wilson Evolution places itself in the middle of the high-end basketball market. There are also a few color variations for those that want something a little more unique. Overall, you can’t go wrong with the Wilson Evolution. It’s perfect for training or competitive play and doesn’t break the bank, either. 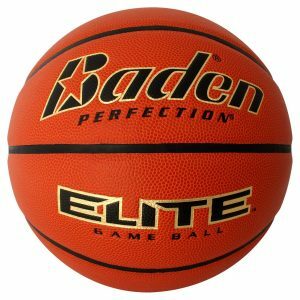 Another popular college basketball, the Baden Elite is Baden’s premium composite leather offering. Baden designed the composite cover to have lots of grip and plenty of tack. It is very similar to the Wilson Evolution, feel-wise. Moisture grip and the recessed stealth soft valve system are its two unique features. The moisture grip gives it good moisture wicking properties (good for players with sweaty hands). Meanwhile, the low-profile valve is gives it a truer bounce and flight. The Baden Elite is in the same bracket as the Wilson Evolution, so for most people it will come down to a small matter of preference. 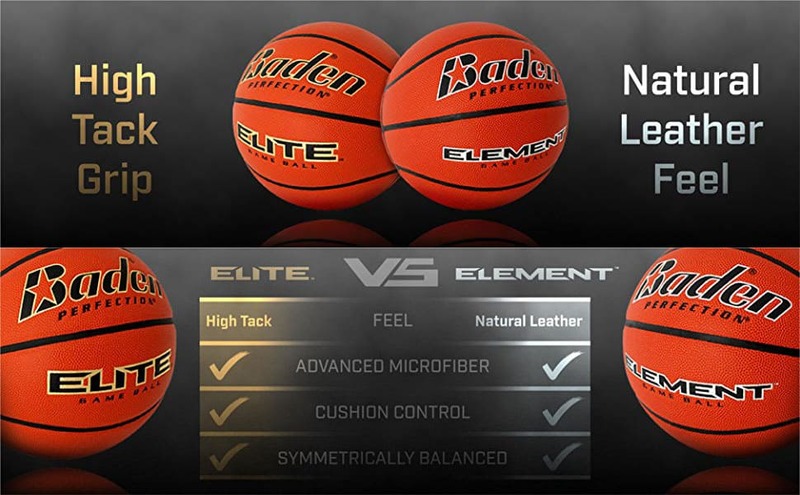 Note: For players who prefer a slightly smoother and less tacky leathery texture, consider the Baden Elite’s brother – the Baden Element Game Ball. Many colleges also use the Baden Element, with the coaches or sports directors having the final say on which. 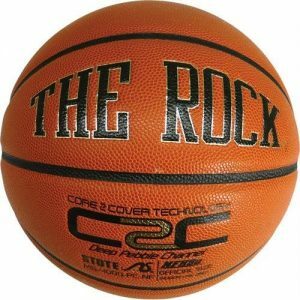 The Rock is a highly praised NFHS-approved basketball that comes from a relatively unknown private brand, John Stote’s Anaconda Sports. If someone mentions The Rock, you can safely label them a basketball buff. With its trademark name and visibly loud lettering, The Rock distinguishes itself from the comparatively bland offerings by bigger sports brands. Like the Wilson Evolution, The Rock also features pebbled seams (channels) to provide a more consistent all-round grip. While grooved channels naturally provide extra grip, having them pebbled further increases grip. Out of the box, The Rock has a super tacky feel. Its bounce is spot-on and doesn’t feel flat or too bouncy. Every basketball will eventually wears away and loses grip. But going by other people’s testimonials, it appears The Rock has superior durability. How fitting, for a basketball that goes by the name, ‘The Rock’! John Stote designed The Rock from the ground up to be the ultimate composite leather basketball. And it’s comes close. However, with the price tag being a tad high, it’s definitely reserved for enthusiasts. 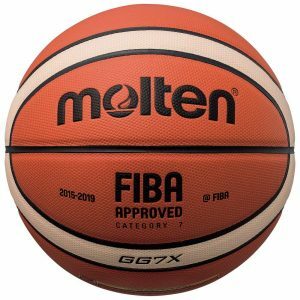 Molten is the official ball supplier at international FIBA competition games. That includes the Olympic games. The Molten X-Series GG7X indoor basketball features Molten’s unique 12-panel design, meaning there are also more (albeit narrower and shallower) channels. If you like making contact around channels, this basketball might just be for you. Molten’s signature GIUGIARO cover design also helps with ball visibility, helping players keep track of the balls rotation. The Molten X-Series feels the most different out of all the basketballs in this list. A big reason for that is because the basketball’s pebbles are symmetrically aligned! The GG7X is a great ball but its texture is slightly controversial. It is a little too sticky and spongy for some, and feels a little synthetic overall. We definitely suggest trying it out before purchasing. 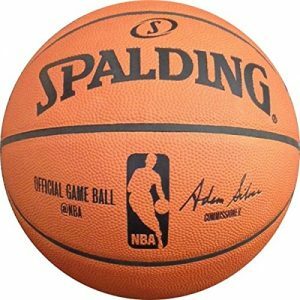 No top indoor basketball list would be complete without the official ball used during NBA games – the Spalding NBA Official Game Basketball. It is the only genuine leather basketball in our list. If you’ve always wanted that natural leather feel, well, this is the real deal. Be warned though, it doesn’t come cheap! Genuine leather basketballs are becoming increasingly hard to come by, and in the 2006-7 NBA season even the NBA switched to composite leather basketballs. It was only because of player complaints that the NBA are back to using genuine leather today. In all honesty, this isn’t a great choice for most people. Nevermind the price, genuine leather basketballs have a substantial break-in period. The NBA uses Spalding’s ‘bounce machine’ to break basketballs in before they are played on court. Shooting, dribbling and bouncing a genuine leather ball has a very special feel. Every basketball player should play one at least once in their lifetime. 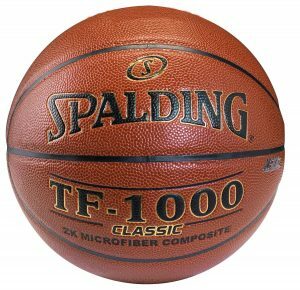 Back in the day, the Spalding TF-1000 was the s**t.
Speak to any older basketball player and they will sing nothing but praise for the original TF-1000. It had the perfect amount of grip, tack and softness. Spalding ceased production of the original TF-1000 (to the disappointment of many), but in 2015 it resurfaced as the Spalding TF-1000 Classic. Unfortunately, the TF-1000 Classic just isn’t the same. It’s a decent basketball that gets slippery when moist and suffers from numerous quality control issues. 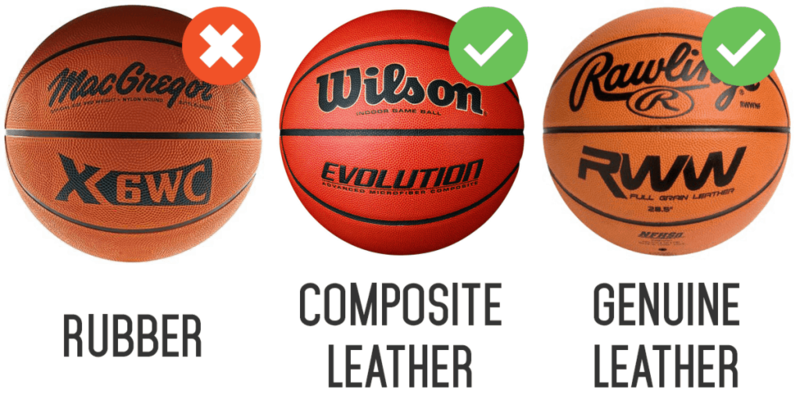 Spalding might be the official ball supplier for the NBA, but the reality is their recent quality for composite leather basketballs is lacking. Indoor basketballs generally cost in excess of $50 and aren’t suitable for outdoor use. An outdoor basketball might not feel as soft to touch or grip as well, but they cost roughly half and can be played on any court. 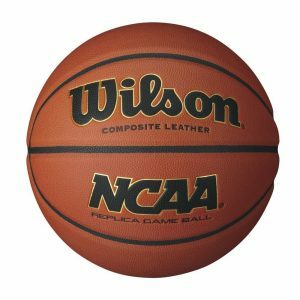 The Wilson NCAA Replica Game Basketball is our favorite budget-friendly option, especially for those who just want a quality ball to train with. It might not be the softest ball, but being made from composite leather, it’s still leagues ahead of any rubber basketball. Which brand of basketball is the best? This is a very subjective question, as different people will have their own preferences. Spalding and Wilson are undoubtedly the big players in the basketball market. However, Nike, Molten and Baden have also produced some of the highest rated basketballs. Can you play with an indoor basketball outside? It can be tempting to play an indoor basketball outside, because they feel better and sometimes we don’t have any other options. However, indoor basketballs should not be played outdoors as their soft outer covers will quickly shred to pieces. Invest in a good outdoor basketball instead. For a good quality composite leather indoor basketball, look to spend in the region of $40-$60. Genuine leather basketballs cost considerably more and are priced in excess of $100. The official size for men and boys aged 15 or older, as set by official governing bodies, is Size 7. Size 7 basketballs have a circumference of 29.5 inches. Women’s basketball leagues use slightly smaller Size 6 basketballs. Size 6 basketballs measure 28.5 inches around. Younger basketball players might want to practice with the standard youth basketball (ages 11 and under) Size 5. These balls have a circumference of 27.5 inches. Options may be more limited at this size. You can probably imagine that the weight of a basketball influences everything from your shots to dribbles. Look for basketballs that are of official weight. All basketballs in our list are of official weight. New basketballs generally come inflated, but you should use a ball pump to get the air pressure within the recommended 7-9 PSI. Bring the ball up to face level and let it drop by free fall. If should bounce up to your waistline. If it goes higher, the ball is over-inflated. Any lower than your waistline and it needs to be inflated a little more.